Ring in 2010 with Sunday dinner at Bouchon! “Bouchon” is the French word for cork, but also refers to the type of restaurant found in and around Lyon. Find out more about Bouchon at www.ashevillebouchon.com. Give A Day. Get A Disney Day. Hands On Asheville-Buncombe is teaming up with HandsOn Network and Disney to celebrate the good things people do for their communities through the “Give A Day. Get A Disney Day.” program. In 2010, Disney wants to inspire one million people to volunteer a day of service to a participating organization in their communities and celebrate their good works by giving each of them one day admission to a theme park at Disneyland® Resort or Walt Disney World® Resort, free. Starting January 1, 2010, guests can go to www.disneyparks.com to sign up for qualifying volunteer opportunities (many of which will be family-friendly). Hands On Asheville-Buncombe, a program of United Way, will be one of the organizations providing eligible volunteer opportunities for the program. Hands On makes it easy for people to lend a hand and help others in our community by volunteering with Asheville and Buncombe County nonprofits throughout the year. To learn more, just visit www.disneyparks.com. 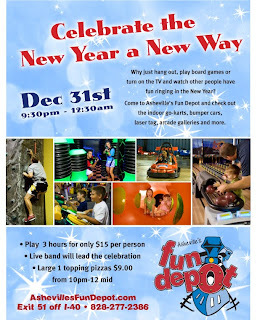 In search for a family fun activity for New Years Eve? Fun Depot has a great deal going for the night. The Mission Health System Board of Directors has appointed Carleton T. Rider to serve as interim president and CEO of Mission Hospital and the health system. Rider, who retired in 2008 as a senior administrator of Mayo Clinic after a career of 31 years, will assume his new responsibilities effective January 1, 2010 and serve until the Board completes its national search for a permanent chief executive. Rider is a senior fellow with the Center for Global Health and Medical Diplomacy at Brooks College of Health at the University of North Florida. 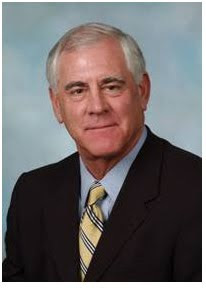 During his career at Mayo Clinic, he served in a variety of roles, including administrator of Mayo Clinic Jacksonville from its initiation in 1984 through 1993. In 1993, he was named Continuous Improvement Officer at Mayo Clinic and in that role served as an examiner for the Malcolm Baldrige National Quality Award. In 2006, he was named the Distinguished Mayo Administrator. To ensure a smooth transition, Renfro said Rider will work closely with outgoing Mission CEO Joseph F. Damore, who announced his decision to resign this past fall. “Once again, we want to express our thanks to Joe Damore for preparing Mission for the many changes and challenges ahead in healthcare,” Renfro said. Renfro also announced that the Board has selected the national consulting firm of Korn/Ferry International to lead the recruitment effort for a new Mission chief executive. Korn/Ferry will work closely with Brumit and the 10-member CEO Search Committee, which is made up of current Board members, including three area physicians. Local healthcare company, Crescent announced that they have acquired Maggie Valley-based Appalachian Benefit Administrators. The move is designed to ensure that major employers in the region will continue to have a local option for their health plan administration services. Crescent plans to close the Maggie Valley facility, but all operations will be moved to its Asheville headquarters and all the existing staff will be retained. The move should be completed during January. Digging back into the files I found this press release from Tonya at Innova Homes. I should have posted this weeks ago. Innova Homes has taken modular green building to the green pastures of Burnsville, NC, raising the standards on technically advanced and sustainable modular construction. The architecturally designed, 2200 sf., arts and crafts style home, is located on a therapeutic horse farm in the mountains of Western North Carolina. The homeowners and architect worked together to create a home that would provide ultimate comfort and minimal energy usage, while preserving the natural beauty of their surroundings. Innova Homes partnered with Professional Building Systems of North Carolina to produce the home, which was designed to take advantage of the modular manufacturer’s capabilities to produce a custom home with the advantages of modular construction. David Bennert, the General Contractor for the project and owner of Innova Homes, worked with the owners to take advantage of the natural features of the site, as well as utilizing local and natural resources wherever possible. Since the site was located on a working horse farm, space was available for installation of a horizontal loop heat exchange system for the geothermal heat pump. The use of horizontal loops significantly reduced the installation cost of the HVAC system, versus comparable vertical well systems. The heat pump was coupled with three independent zones of control, a high-efficiency Morso soapstone wood stove, and an ERV for fresh air exchange. The programmable thermostats, part of the Water Furnace geothermal system, also allow the user to control the redistribution of heat from the wood stove, using the air handler independent of the heat pump. In this mode, warmed air is moved to cooler zones of the home based on the individual zone temperatures and demands. Other sustainable technologies include solar hot water heating, and a sealed crawl space constructed with insulated concrete forms, resulting in a highly efficient R-22 crawlspace wall. Five and a half inches of Icynene open cell spray foam insulation was installed in the exterior walls during construction at Professional Building Systems, and eight inches of Biobase foam insulation was site installed on the roof decks. This approach provides for a much tighter shell and dramatically improved energy costs. Indoor air quality has been maintained through a combination of ERV air exchange with HEPA filtration, as well as carefully selected finishes, including zero VOC primer and paints from Benjamin Moore, and locally produced, non-toxic natural acrylic resin floor finishes from EarthPaint. Recycled Brazilian cherry flooring, kitchen cabinets, granite counter tops, as well as kitchen and bath fixtures were purchased from Habitat for Humanity, and reused/repurposed throughout the home. Salvaged chestnut was utilized for trim, while excavated stone from the site provided beautiful trim work for the foundation and porches. As with all of Innova Homes’ projects, on-site recycling stations were established for construction waste, including glass, cardboard, aluminum, metal and plastics. The home includes two beautiful screened in cedar porches off the master bedroom and living room. These areas encourage outdoor living and the use of natural cooling, while offering outstanding views of the surrounding mountains. Innova Homes built their first green modular home in 2003, and has steadily improved their efficiency and quality over the last six years. Modular construction uses less building materials, preserves natural resources, and produces less construction waste, leaving a smaller ecological footprint than conventional on-site construction. By incorporating more advanced insulation, HVAC, and finishes, Innova Homes has been able to advance modular construction to a sustainable level far above most site built projects, while saving time, money and resources. For more information on green building technology or modular construction, contact David Bennert at 828-273-3765, dbennert@innovahomes.net or visit www.innovahomes.net. In a joint announcement with the NC Department of Commerce, Buncombe County, and the Economic Development Coalition for Asheville and Buncombe County (EDC), Thermo Fisher Scientific released plans today to create 104 jobs and invest $5 million during the next three years at its plant in Asheville. Located in Buncombe County for over 25 years, Thermo Fisher Scientific currently employs approximately 540 persons at three local facilities, including a manufacturing plant, warehouse and technical customer service center. “Advanced manufacturing is a significant economic driver in our region, providing quality benefits, wages and career opportunities for over 18,000 Buncombe County residents. The EDC is grateful to Thermo Fisher Scientific for choosing to expand its facilities in Buncombe County. This is a significant commitment to retain and grow jobs and invest in our community,” said EDC Chair Bob Roberts. Thermo Fisher Scientific is a leading global provider of analytical instruments, equipment, reagents and consumables, software and services for research, analysis, discovery and diagnostics. The company employs approximately 35,000 people in 40 countries, serving 350,000 customers primarily in the life sciences and health care markets. As you drive around town searching for Christmas presents, be sure to watch for the HO HO GoMini. 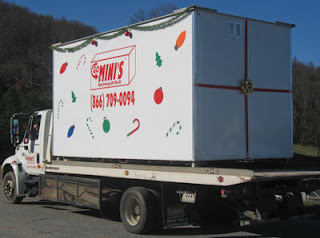 Starting Thursday, December 10th and ending Tuesday, December 22nd, you will be able to spot the “HO HO GoMini” complete with Christmas décor as it makes its rounds via the GoMini delivery truck throughout the Asheville area. Available in 12’, 16’ and 20’ lengths, GoMinis are the perfect self-storage solution. Constructed with a sturdy steel frame and translucent roof to allow light within, GoMinis feature a roll up, locking door to secure stored items. The accessible ground level containers are easy to load, yet slightly elevated from the ground to prevent water leakage. GoMinis can be delivered to both residences and businesses and when loaded, can be left on site or retrieved and stored at the local GoMinis warehouse. A convenient, inexpensive portable self-storage solution, GoMini’s became a local storage sensation in 2005 when owner Robie Campbell purchased the Asheville territory. Since that time, Campbell has also purchased the Charlotte, Hickory and Myrtle Beach territories. 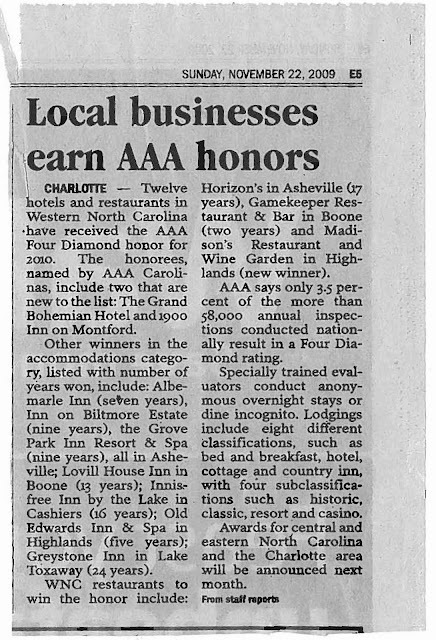 In 2009, Campbell was named “GoMini’s Dealer of the Year” as well as the Asheville Area Chamber of Commerce’s Small Business Leader of the Year for business with fifteen or fewer employees. Below is an update/report from the Health Adventure soon to be known as Momentum. Work is continuing on Momentum and the more I learn about the new facility the more excited I get. It should be a lot of fun for kids of all ages. The Weaverville Business Association invites you to enjoy the sights and sounds of a small-town Christmas in downtown Weaverville during the 6th Annual Christmas Candlelight Stroll on December 11, 2009, from 6 until 9 p.m. The festivities actually begin a little before 6 p.m. when Santa rides into town on his horse-pulled carriage (his reindeer need to rest up for their big day). He’ll be at M7 Realty, available for pictures and to hear everyone’s Christmas wishes. Strolling along Main Street, visitors will find merchants open late and local church and school groups, as well as the Asheville Barbershop Quartet, will be caroling throughout the evening. The night will also feature entertainment, inside and outside our local businesses, from members of the Montford Park Players, Mars Hill College flute ensemble, Joyful Noise Dragonscales Chamber Quartet, Mountain Thunder Cloggers, North Buncombe Middle School band, Jill Totman storytelling and more. Also happening that evening, new Weaverville Mayor Al Root will do the honors at the official tree lighting ceremony at 7:30 p.m. (at the clock), and horse and carriage rides tours will be available throughout the night for those wanting to rest their weary feet. Hot Chocolate and raffle tickets for gift certificates and gifts from some of our local businesses will also be on sale (the raffle drawing will be held at 9 p.m., and you don't need to be present to win). Profits from event activities go to the North Buncombe Samaritan Ministries to help those in need this holiday season, as well as throughout the year. Governor Bev Perdue invites the public to visit the Executive Mansion – the People’s House – for a Holiday Open House Dec. 10-13. Visitors will have the opportunity to view the mansion’s beautiful decorations and enjoy holiday entertainment provided by musical and choral groups from across the state. The Western Residence board of directors also invites visitors to the Asheville home to view its holiday decorations Dec. 5-6. Saturday, Dec. 5 10 a.m. – 7 p.m.
Sunday, Dec. 6 1 p.m. – 6 p.m.
No advance reservation is necessary. The Governor’s Western Residence is located at 45 Patton Mountain Road. For questions regarding the Western Residence open house, visitors should contact Juleigh Sitton at 828-430-0054. If I had a list of frequently asked questions in my job, this would certainly be near the top of the list: "How can I use Facebook or other social media to market my business?" Now I am not an expert on the topic but there are many in our community who are. To get you started on your path to this new school of marketing here is a link to a NY Times article on using Facebook to Market your Business. Asheville's Eigth Brewery to Open Soon! After months of patiently waiting Craggie Brewing Company is ready to open its door and let the taps flow. Below is a press release about the opening, stop in and check it out. They are also hosting a Chamber night and ribbon cutting on Monday, November 23 at 5:30 please come and join us. Craggie Brewing Company will celebrate the opening of its Public House at 197 Hilliard Avenue, downtown Asheville on Friday, November 20th and Saturday, November 21st from 4:30-10:30pm. In November 2007, Bill Drew and Jonathan Cort partnered to create a hometown brewery, with passion for quality craft beer and strong community values. Two years to the date Craggie opens for business with its Battery Hill Bitter and a seasonal pale ale on tap. Solshine and Swannanoa Sunset will be ready the following week and Craggie brew will hit select watering holes Thanksgiving weekend. Regular Public House hours are Wednesday through Saturday evenings from 4:30-10:30pm. The Craggie crew is available to discuss private party rental, schedule brewery tours, and handle your retail keg needs. Please refer to craggiebrewingco.com for further detail about Beer City USA's newest microbrewery. The Asheville Area Habitat for Humanity received one of five statewide awards this week at the Affordable Housing Conference in Raleigh. The award was for the Enka Hills development that is wrapping up, I believe the last house is under construction now. Five affordable housing developments will receive Housing North Carolina Awards on Nov. 3 during the N.C. Affordable Housing Conference at the Raleigh Convention Center. Sponsored by the N.C. Housing Finance Agency, the awards recognize outstanding affordable properties that can serve as models for other communities. More than 500 people are expected to attend the 20th annual awards luncheon. This year’s winners range from Wilmington to Asheville and include two neighborhoods of energy-efficient homes that are affordable for lower-income buyers. Other winners include a large apartment development that replaced public housing and a shelter and transitional apartments in two central North Carolina communities that help families move from homelessness to self-sufficiency. Barrington Village, a neighborhood of 24 single-family homes in Raleigh, developed by Builders of Hope. Enka Hills, a community of 55 single-family homes in Enka, developed by the Asheville Habitat for Humanity, with funding from the City of Asheville, the Janirve Foundation, and the W&S Charitable Foundation. The Pointe at Taylor Estates and Robert R. Taylor Senior Homes, adjacent apartment communities for families and seniors in Wilmington, developed by Housing and Economic Opportunities, Inc., with funding from the City of Wilmington. Families Together in Charlotte, townhome apartments for homeless families with children, developed by YWCA Central Carolinas, with funding from the City of Charlotte and Christ Church. Fifth Street Shelter in Statesville, a homeless shelter that was developed by Diakonos, Inc., to replace the longstanding existing shelter. The winners were selected for affordability; design (attractiveness, energy-efficiency); contribution to the community; sustainability as affordable housing; and features such as services for residents and creative partnerships. Enka Hills is a 55-home community developed by the Asheville Area Habitat for Humanity that is part of Buncombe County’s master plan for affordable housing. Located near Enka’s athletic park, the homes are designed in the Arts and Crafts style, with full front porches, to reflect other neighborhoods in the Asheville area. The homes have two, three and four bedrooms and range in size from 884 to 1,494 square feet. They all incorporate energy efficiency measures, including SystemVision, and all are NCHealthyBuilt Homes. Buyers can purchase an energy-efficient front-loading washer/dryer combo at a substantial discount, and if needed, can finance the purchase through their mortgage at $1.75 per month. The homes all have storage units and parking pads. Several homes are handicap-accessible, and the exterior design allows for minor retrofitting to add a ramp should one be needed at a later date. Homeowners all take a landscaping class through the N.C. Cooperative Extension, and they provided most of the labor for the community’s landscaping. The homes were built with the homeowners’ “sweat equity,” as well as with volunteer labor during several Homebuilder Association blitzes. The City of Asheville and the Janirve Foundation provided funding to acquire the site and for infrastructure development, and the W&S Charitable Foundation also contributed. The homes cost $140,000 to $175,000. The N.C. Housing Finance Agency provided gap financing to the Asheville Area Habitat that provides $25,000 of financing at zero interest for each homeowner. Contact: Lewis Kraus, executive director, Asheville Area Habitat for Humanity, 828-251-5702. I got an email from a local photographer, John Fletcher. I know John takes photos for the Citizen-Times and has Fletchpix.com. I have been an admirer of his work for quite some time. This coffee table book should be great. 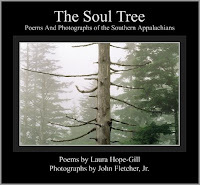 What: Reading and signing of “The Soul Tree: Poems and Photographs of the Southern Appalachians,” with poet Laura Hope-Gill and photographer John Fletcher Jr. When: 7 p.m. Saturday. Free. Where: Malaprop's Bookstore/Café, 55 Haywood St.
To learn more: Visit our website at www.TheSoulTree.org. Two River Cleanups this Weekend with Riverlink! RiverLink Adopt-a-Stream Teams are conducting two cleanups this weekend - come out and join them in making a difference to cleanup the French Broad River! Saturday, November 7th 10am - join the Underground Church team for their cleanup of the Swannanoa River along Thompson St. Meet at the intersection of Glendale and Thompson St. All cleanup supplies will be provided including safety vests, gloves, trash bags and pick up litter sticks. Sunday November 8th 8:30am - join the UNCA Outdoors Program team for their cleanup of Hominy Creek. Meet in the Hominy Creek Park parking lot at the end of Hominy Creek Rd. All cleanup supplies will be provided including safety vests, gloves, trash bags and pick up litter sticks. The Chamber partners with many organizations in our community to make sure that small business have every opportunity to succeed. The SCORE Association, “Counselors to America’s Small Business,” is a nonprofit association comprised of 10,500 volunteer business counselors throughout the U.S. They have a strong presence in the Asheville community and provide some great resources that a small business might not typically be able to afford. 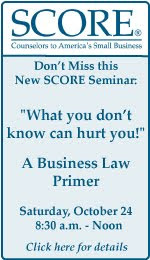 This seminar will address broad issues such as entity selection, risk management and corporate compliance. When do independent contractors become employees? Tips on Hiring and Firing. From start up companies to expanding businesses , the discussion will identify the questions you need to ask and how to apply the answers to your specific industry. Marjorie Maginnis is an attorney who focuses her practice in the areas of labor and employment, real estate and business transactional law. With over 13 years of experience, Marjorie has served as in-house counsel and worked in private practice. She has focused her efforts on working with public and private employers and assisting them with risk management, litigation prevention, contract drafting and review as well as representation before administrative agencies, district and appellate courts, mediation and arbitration. One of our really unique members the Land of the Sky Chorus has a really interesting event coming up check it out this Saturday. The Land of the Sky Chorus will present their annual Asheville show of harmony and hilarity, this year called "SHTICK TO SINGING", at the Diana Wortham Theatre, on Sat. Oct 24. The show starts a 7:30 PM. The show will feature the 45-man Land of the Sky Barbershop Chorus and quartets, along with special guest quartet, the Dixie District 2009 Champion Quartet "LET'S SING!!". Tickets are $18 preshow, and $20 at the door (children 12, and under, free), and are available from the Land of the Sky Chorus by calling 866-290-7269 (see more information at ashevillebarbershop.com), or from the Diana Wortham Theatre Box Office (.dwtheatre.com/box-office; 828-257-4530). For sure, no other show features a judge with a croquet gavel, “Little St Nick” on a skateboard, 50 Elvis aspirants performing his torch-rock hit “Love Me,” the candy-apple myopia of “Rose Colored Glasses,” the artistry of Leonard Bernstein’s “Somewh......ere,” an intensely factual rendition of the “Copper Clapper Caper,” a 39-inch diameter powder puff, harmony galore and back by popular request with some new surprises: the uproarious reenactment of the entire Ed Sullivan Show in 2 minutes and 57 seconds!!!! More and more family friendly activities for the fall and Halloween keep rolling in. The event at the nature center sounds like fun. Special pricing begins at 1:00 p.m.
Come visit the Western North Carolina Nature Center on Gashes Creek Road in East Asheville for Howl O’Ween! Creatures of the darkness will be on display in the Creepy Crawler Cabin along with a fabulously large 8 ft. Burmese python, a 5 ft. Red Tailed boa, legless lizards, a mass of squirming baby turtles and Halloween colored corn snakes galore brought by members of the Southern Appalachian Herpetological Society! Every hour starting at 2 p.m., learn about skulls, bats, snakes and other creepy creatures through nature programs and enrichment presentations. With arts & crafts, hot dogs, hot cider and chocolate, baked goods, and treats for the kids, a costume contest at 6:30 p.m., as well as two performances by the Mountain Marionettes at 7:00 and 7:40pm, it’s a great beginning to the ghoul season! Come dressed for the occasion! For more information about Howl O’Ween, please contact Keith Mastin, Education Curator, at (828) 298-5600 ext. 305. This press release from the Buncombe County Health Center just arrived in my inbox. The first H1N1 shots take place tomorrow! These are the only groups that will be vaccinated at this first clinic. The Health Center has narrowed the priority list for this clinic because of a limited supply of vaccine. “Pregnant women and children have shown the highest rate of hospitalization and death overall so we’re beginning with them”, said Gibbie Harris, Health Center Director. More shipments of the H1N1 vaccine are expected and the priority groups eligible for it will expand as more vaccine arrives. “We hope the community will support this effort and let those most at risk get the vaccine first,” said Harris. This vaccine comes from a variety of sources, and the Health Center has no control over what is received but will provide what is available now in this clinic. The shot in the arm will be available as well as flu mist for those who meet certain medical qualifications. Anyone who has had seasonal flu mist must wait at least 28 days before having H1N1 flu mist. These people may have the H1N1 shot at any time after the flu mist. There is no cost to individuals for this vaccine. Those who attend the clinic on Saturday should park in the County parking deck and enter the Health Center from the courthouse side rather than the front parking lot. Entrance to the deck is on College Street across from the Courthouse. The public may also enter the deck from Woodfin Street this Saturday. There will be no charge to park in the deck during the H1N1 vaccine clinic. As additional vaccine arrives in the county, some area physicians will receive allotments for their pregnant patients as well as for their patients who are young or who fall into a high risk group. Those who are unable to attend the clinic on Saturday should check with their physician to see if they will receive vaccine. This supply of the H1N1 shot has a trace amount of preservative. Children who are under 10 years of age will need to have a second dose of the H1N1 vaccine in order to have full immunity from this novel flu. The second vaccine should be received at least 4 weeks after the first. I have heard some rumors about some big news coming from the YMCA of Western North Carolina. This is the first of a few announcements that I expect to hear from them this fall. Asheville, NC, Oct. 14, 2009 The YMCA of WNC today announced it received a $663,000 grant from the Department of Education to open two 21st Century Community Learning Centers in Buncombe County Middle Schools. “This award represents the largest program grant the YMCA of Western North Carolina has ever received. It is a wonderful vote of confidence in the YMCA, our relationship with Buncombe County Schools and the amazing work of our staff,” said Paul Vest, president of the YMCA of WNC. The grant was given as part of the No Child Left Behind Act by the Department of Education through the North Carolina Department of Public Instruction. The purpose of the 21st Century Community Learning Center Grant funds are to assist schools, local educational activities (LEAs), and faith or community-based organizations to provide before school, afterschool and summer services through the establishment of the 21st Century Community Learning Center Programs (21st CCLCs). The learning centers will be located in Erwin and Enka middle schools and will open Oct. 26, 2009. The centers will serve students Mon. through Thurs. with after school programs focusing on academic enrichment to improve student performance through tutoring and direct assistance. The centers will also work to increase parental involvement and support by offering evening classes focusing on English as a Second Language (ESL) and GED education throughout the year. The centers will provide an arena for programs to improve math and literacy levels of students, support student learning and development through enrichment opportunities, building character and increasing graduation awareness and developmental assets. The YMCA, in partnership with Buncombe County Schools, is working collaboratively with the Literacy Council of Buncombe County, LEAF in Schools and Streets, Asheville-Buncombe Technical Community College, POETIX and the Buncombe County Sheriff Office to make this program a success. “Throughout our 120 year history of serving, the YMCA has looked for opportunities to address the needs of our communities. We are ecstatic that the state is giving us, with Buncombe County Schools, the resources to positively impact and enrich the lives of these middle school students and families,” said Vest. Each 21st Century Learning Center will serve 75 students and their families, and will choose students based on their math and reading scores. State testing actually identified more than 400 students eligible. The funding will be spread out over four years, decreasing in amount throughout the cycle and is contingent on successful completion of grant requirements and evidence of growth and progress. I have been reading a few leadership books lately and this program sounds great. The WriteMind Institute always pulls together great programs, check it out! Dave Olsen will speak about his experience as well as interact with the audience in a discussion about authentic leadership in large and small organizations. Dave’s relationship with Starbucks began while he owned and operated one of Seattle’s original coffee bars; he was an important account for Starbucks in the early years. Later, sourcing coffee and developing blends for Starbucks allowed Dave to cultivate relationships with small communities all over the world. In addition to working at Starbucks, Dave has served on multiple non-profit boards with national and international influence. Dave Olsen and Jonathon Flaum, director of WriteMind Institute, have found common ground in discussing the principles of servant leadership as well as the merit of having corporate executives in kayaks. Horsesense is one of those Chamber members that always has something new going on that I am really intrigued by. Some of the Chamber staff are venturing out of the office soon for a tour and visit with the Horsesense. Look for some photos and a blog post about that soon. Horse Sense of the Carolinas will be holding a series, Meditating With Horses, on Thursdays this fall. Session will be held October 22 and 29, and November 5 and 12 from 6:00 p.m. to 7:00 p.m. The hour will consist of a series of meditations and horse interactions, while enjoying the fall sunset at the beautiful mountain setting of the Horse Sense farm in Marshall. No prior experience with horses is necessary. 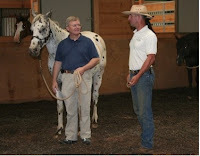 Please contact Horse Sense to register at 828-683-7304 or visit the website: www.horsesenseotc.com. Each session will cost $20. Horse Sense has been creating positive change for people and horses in Western North Carolina since 2003 and is an EAGALA-approved Provider of Continuing Education, with the first EAGALA Advanced Certified staff in the United States. Two local community / developments are planning fall festivals for the weekend, one in North Asheville at Reynolds Mountain and one in South Asheville at Biltmore Park. Have a fun and safe fall weekend, looks like a wet one. On Saturday, October 17th, you're going to want to check out the Fall Fest 2009 in Biltmore Park Town Square. There you'll meet face painters and music makers, pumpkin painters and balloon fairies; a magacian, storytellers adn even the gang from Sesame Street! You'll find something to see on every block. So bring a friend, bring the kids - and be there too! Shop, eat and enjoy a day outside. The fun starts at 11 and lasts all afternoon. Then once the sun goes down, dance and sway under the stars as The Caribean Cowboys take the stage for a free outdoor concert. Oktoberfest at the Reynolds Mountain Pavilion. Join us for food, beverages, and a tour of our available properties. Travel North on Merrimon Ave from Downtown for 3.5 miles. Turn right into the second entrance of Reynolds Mountain which is Senator Reynolds Road. Go past the new YMCA through the gates and straight up the mountain until you see The Pavilion at the corner of Summit Tower Circle and Senator Reynolds Road. What Kind of "Horse Cents" Do You Have When It Comes To Showing Your Company's Community Commitment. Express Employment Professionals invites you to show your company's Horse Cents and help children this holiday season. We are bringing the Express Clydesdales to town to lead the Asheville Holiday Parade on Saturday, November 21. Knowing how much these gentle giants delight and excite big and little kids alike, we are offering your employees and their children a chance to ride on the Express Clydesdales Wagon and meet one of the Clydesdales for a photo session. All you have to do is show your Horse Cents for Mission Children's Hospital. Visit us at expresspros.com/Horsecents to learn how your company can help. Continuing my series on some basic social networking tools I thought I would start with some videos on Linkedin. Linkedin is as close to traditional business networking as an online program can get. It is easy to use and easy to understand. The number one question I receive at the Chamber revolves around the use of social networking sites such as Facebook, Linkedin, and twitter. It seems that everyone is at least curious, can this help my business, am I missing opportunities because I am not on the sites, are my competitors doing it, how much time will it take, how do I get started. These are questions I receive every week. I have decide to post a little mini series of tutorials on how companies can get started. We have plans to do some in person trainings at the Chamber in the upcoming months but the tutorials that I post here are a great way to get a base education on the tools so that the trainings at the Chamber can be more useful. I am not recreating the wheel, there are lots of videos already online on how to use social networks and they are done in more creative ways than I can produce so I will be pulling ones that I think do the best job of explaining the tools. I thought I would start at the beginning with what social networking sites are and why you might want to consider using them for your business or professional life. Every now and again I am incredibly moved by the efforts of our membership. This is one of those examples. Local business women, Earleen Bennett, has founded a new organization named Beauty Through Cancer. The group provides therapy and social opportunities for cancer patients and survivors. Earleen also provides, what I would call, self esteem assistance in the form of permanent makeup and wigs. They are celebrating Breast Cancer Awareness Month on Oct 1st. Here are the details. What better way to kick off Breast Cancer Awareness Month than to introduce Beauty Through Cancer to the City of Asheville. Join members of our organization, Board of Directors and volunteers as well as Mayor Terry Bellamy and other City Officials as we celebrate "Beauty Through Cancer" day in Asheville. The day will begin with businesses from all over the Western North Carolina Area donating a pledged amount of at least $1 for every customer, client, or patient they serve on October 1st to Beauty Through Cancer. You can see a list of businesses on our website that are generously supporting Beauty Through Cancer on this important day. "You could be one" !!!!!! Enjoy food by Chef in Motion, Wine by WineStyles, beer, door prizes, raffle prizes, music and fun as you mingle with elected officials, community leaders, business professionals and the community at large. Meet our volunteers, board of directors and hear inspiring stories of cancer battles and survivorship! We look forward to meeting you and getting to know you. On Monday, October 5 at 12noon, Asheville Area Habitat for Humanity will raise the wall of another Habitat house being built in the Enka Hills neighborhood. This time though, the house sponsor isn’t a faith community, civic group or local business – it’s the board of directors and staff of Asheville Area Habitat for Humanity! Executive Director Lew Kraus had been saying for the past twelve months that “The economy may be in a recession, but Habitat’s mission is not.” Board Vice-President Fred Barbour decided that it was time to show the community that the need for affordable housing is greater than ever and he called upon Habitat’s strongest proponents – its board and staff, to make that point. To that end, the funds and labor for this house will be coming from its internal team. The media and public are invited to attend this special event – which happens to also be World Habitat Day 2009. And, this house will be the 200th Habitat house built in this community. After a short speaking program, Habitat board and staff members will join with the Noteboom family to raise the first wall of this 4-bedroom HealthyBuilt home. In the past 25 years, Asheville Area Habitat for Humanity has welcomed 192 Buncombe County families to safe, decent and affordable houses. Habitat homes, which are HealthyBuilt certified, are sold at no profit to partner families, who pay back a no-interest loan. Wow, I would like to sit back and watch this go down, a bunch of couples racing for a $20k ring! A $20,000 Lazare Diamond ring has been hidden somewhere in downtown Asheville and it’s up to you to find (and keep!) it! The 1st Annual North Carolina Diamond Ring Race is a city-wide treasure hunt brought to you by Wick and Greene Jewelers! In this high-tech treasure hunt, all of the clues and riddles will be delivered via text message right to your cell phone! Any cell phone, any model, on any carrier can play! And playing is totally FREE! However, spots are limited and you must win a spot to participate. Visit northcarolinadiamondringrace.com and submit your story why you deserve to win the ring! The race takes place on September 27 from 1 - 6 p.m.
Make sure you register so you can participate! Weaverville's third Annual Art in Autumn outdoor arts and crafts festival takes place September 19, 2009, from 10 a.m. to 5 p.m. Rain or shine, for one full day Main Street in Weaverville, NC will be transformed into a marketplace for over a hundred juried artists and craftspeople. The music stage will feature old-time and bluegrass music. In addition to festival food vendors, area restaurants such as Blue Mountain Pizza, Well-Bred Bakery, Mike's Main Street Grill, and Sunnyside Cafe will be open during the festival. Parking is available in designated parking lots off north and south Main Street. There are designated areas for handicapped parking as well. All are welcome. Admission and parking are free. I know everyone out there is already struggling to come up with a great gift for everyone's favorite holiday, Bosses Day! The Asheville Independent Restaurant Association has answered your prayers by hosting the 2nd Annual Bosses Day Golf Tournament. I volunteered at last year's golf tournament and it was a blast. The day starts with mimosas and blood mary's along with a continental breakfast and ends with a culinary reception following the round of golf at the Broadmoor. Check out all the details for the day by downloading this form here! Panera Bread in South Asheville is hosting a free Friday acoustic concert series starting today, September 11 running through October 2. The music is from 7 - 9, sounds like fun! Mini sessions can be used for a family portrait, just for the kids, for couples and individuals. Fun, natural portraits by a local professional photographer offered as an option other than school portraits or traditional holiday photos. A mini session is a 15-minute photo session by appointment for $25. Includes: an online album of the images, 2-5x7 prints and a set of wallets. Any reprints ordered within 2 weeks of your album being ready, you get 20% off. or call: 828.242.2308. Space is limited, so call or email soon! Camilla Calnan Photography is also offering several portrait specials right now if you would to prefer to schedule a session that will give us more time to work together. Susan Stone, owner of Stone Digital Media, launched the company this past January, 2009. Stone Digital Media specializes in transforming your photos, slides, video clips & music into a beautifully crafted multimedia production that can viewed on your dvd player, computer or website - so that you can preserve and celebrate the special moments of your life - from birthdays to corporate events. Also check out a demo for Stone Digital Media here. 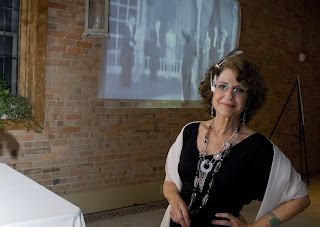 Here are a few photos from the Roaring 20's Gala that took place at The Venue a few weeks back. From everyone I have talked with the event was a blast, look for future decade themed parties from the American Cancer Society. Dancing at the Roaring 20's Gala, notice our own James Carter, Director of Membership Sales, getting his groove on in the hat! Recently I stopped into a Kmart and couldn't help but notice some significant renovations underway and yesterday all four Asheville Kmarts rejoined the Chamber. So when I saw someone mingling at the Business After Hours last night with a Kmart name tag on, I immediately sought him out to learn what is happening. I talked with Randy, a senior management leader with Kmart corporate / Sears, for quite a while about a "Rediscover Kmart" program. Place an order online at mygofer.com or call them. They collect your order and notify you via text, email, or phone when your order is ready for pickup. If you want something that Kmart doesn't stock, they will get it from another store and have it waiting for you. No extra charge! The mygofer program sounded really interesting and I plan on trying it out sometime soon! In response to increased needs at local non-profit organizations, Hands On Asheville-Buncombe has added a number of community projects to this year’s annual Day of Caring on Sept. 3. Now in its 18th year, Day of Caring engages volunteers from local businesses in service to the community and acts as a kick-off to United Way’s annual campaign. Hands On Asheville-Buncombe, a program of United Way, connects individuals and small groups with flexible volunteer opportunities to meet critical needs at multiple nonprofits within the community. Individuals who haven't already signed up for a Day of Caring project with their employer are invited to sign up for a project on their own. Space is limited and must be done by Aug. 31. Last year during Day of Caring, volunteers donated more than 5,500 hours of service, saving community organizations more than $107,480. In connection with Day of Caring, Hands On Asheville-Buncombe also held its annual School Supply drive with United Way’s Highlands Circle, Leadership Givers under age 40. This year, thanks to the support of the community, more than 500 children served by Children First, Big Brothers Big Sisters and Salvation Army will receive fully stocked backpacks. Join United Way as it kicks off its 2009 campaign and send the Day of Caring volunteers off in style on the morning of Sept. 3rd from 7:45-8:45 a.m. with a pep rally at Stephen's-Lee Center (30 George Washington Carver Ave). This is a free event. RSVP at unitedwayabc.org or call 255-0696. 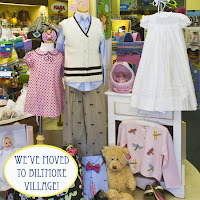 Just Ducky Originals, LTD, an Asheville-based children’s clothing manufacturer with stores in Asheville and Waynesville announced today that it will be relocating its Asheville store from 100 Charlotte Street to 10 All Souls Crescent in Biltmore Village. The new location has a planned opening date of Friday, September 4th – Labor Day weekend. Sallie started Just Ducky nearly 30 years ago in the attic of her Asheville home. The company has grown to a multi-million dollar venture with over 300 women selling the children’s line in home shows across the country. Two Just Ducky retail locations specialize in classic fashions for boys and girls, where you’ll find the Just Ducky line at 30%-50% off, as well as other beautiful children’s lines, unique baby gifts, and a large selection of accessories. Llamas Invade Maggie Valley Club! Maggie Valley Club receives some huge publicity, NBC Nightly News, for the new Llama Caddy program that recently started. Starting next Thursday, August 20th , golfers will be able to have a llama be their caddy at Maggie Valley Club. Llamas and their handlers from llamacaddy.com will be available for afternoon tee times with golfers. Golfers will walk the course with their llama caddy. Each llama will have a handler with it who will attend to any needs of the llama throughout the 18 holes. Llamas are South American animals related to camels that have been used as pack animals as far back as the Incan empire. Llamas are great on the golf course because instead of regular hooves, llamas have soft pads on their feet which do not tear up the delicate grass on the course. The llamas can each carry 2 sets of golf clubs. Llamacaddy.com is located in Brevard, NC. The llamas of llamacaddy.com are currently working with Sherwood Forest Country Club and now Maggie Valley Club. Llamacaddy.com has been featured on BBC News and this past Sunday was seen on the NBC Nightly News after the PGA Championship. In addition to golf caddies, llamas.com also books special events and children’s parties. The llama rounds will happen every Thursday at 5 pm now through October 29th. Rounds of golf will include 9 holes and cost $70 plus tax. The number of llamas is limited and they will ONLY be available on Thursday afternoons. Please call the Maggie Valley Club Pro Shop at 828-926-6013 to schedule your round! The YWCA is one of many community organizations that really impress me. They do great work for our community and they do a great job communicating that work. If you don't know about or haven't been to their blog lately it is full of great stories that will inspire anyone to get involved! The YWCA of Asheville, located at 185 S. French Broad Ave., will hold “Neighborhood Appreciation Day” on Saturday, August 29th from 9:00 am until 3:00 pm. The YWCA encourages neighbors to stop by for snacks, tours, and coupons for free swim lessons. Visitors will be able to try out fitness equipment and classes including Yoga and Cardio Circuit. Water Aerobics and family swim will be offered in the YWCA’s solar-heated pool. In addition, the joining fee for Club W: The YWCA Health & Fitness Center will be waived for Neighborhood Appreciation Day. The mission of the YWCA is eliminating racism and empowering women. The YWCA offers a wide variety of programs aimed at bridging gaps in health care, childcare, earning power and education. The Health Insurance Pilot Program or H.B. 212 passed the North Carolina General Assembly on August 6, 2009 and was delivered to Governor Perdue on Friday, August 7, 2009 where it awaits her signature of approval. The Health Insurance Pilot Program aims to allow the pooling of small and large businesses with hopes to demonstrate an affordable employer based health insurance plan for businesses. The pilot program could help to insure as many as 25,000 workers in the Asheville area. The Asheville Area Chamber of Commerce and the Business Healthcare Roundtable have been working on a plan to provide affordable health insurance for local employees and employers for the past six years. The process has involved discussion with and input from large and small business in Buncombe County, physician groups, Blue Cross and Blue Shield, and United Healthcare. “Asheville is comprised of many great small businesses. We have long recognized the rising cost of health insurance and the inability of many of our small businesses to afford insurance for their employees. We are excited that Asheville can lead in the attempt to help bring affordable health insurance to North Carolina,” said Richard J. Lutovsky the President & CEO of the Asheville Area Chamber of Commerce. Chamber employees and leaders from Western North Carolina are now working diligently to put the pilot program into practice. Many of Buncombe County’s largest employers will be participating in the final design of the product. H.B. 212 received unanimous support of all the members of the Western North Carolina delegation. The bill’s primary sponsors are Representatives Bruce Goforth, Susan Fisher, Ray Rapp and Jane Whilden. “This is a great opportunity for Western North Carolina to be the first pilot program in the state that allows employers to work together to reduce health insurance costs and make it easier for our companies to provide the insurance that so many residents need today,” said Representative Bruce Goforth. Senator Martin Nesbitt led the efforts in the North Carolina Senate. Click here to read the full legislation! In case you missed the story in the Asheville Citizen-Times on Sunday, a new board game has been launched by some Asheville based parents called: Divvy for Life. The game aims to teach children the basics of money management so that they can learn healthy financial habits early in life. Read the Citizen-Times story on Divvy here. Three concerned parents from the Asheville area have created a simple but effective interactive product dedicated to helping other parents teach their children how to save, spend, invest, and donate money, more relevant than ever in today’s lagging economy. The Divvy program has been endorsed by the CPA Association of North Carolina and is featured on their website – www.ncacpa.org. This comprehensive effort to promote financial literacy with children is also supported by State Senator Josh Stein of Wake, NC. Maureen Scullin, Managing Partner of Asheville’s MarketImpact Marketing & Promotion, enthusiastically endorsed the concept on behalf of her own twin daughters, Maddie and Brooke, age 9, and became a partner in Divvy for Life in 2007. Scullin is one of the marketing innovators for Mission Hospitals’ award-winning Lighten-Up 4 Life program. Tony Delia, president and creative director of The Delia Design Co., is the third Divvy partner. In partnering with Corbin and Scullin, Delia was equally concerned about his six-year-old daughter’s financial literacy and says that now Sydney has learned the basics of how to intelligently divide up her funds, she’s on her way to solid lifelong money habits. Delia created the colorful Divvy box design, contents and all graphic materials for promotion, which will be launched in July. Details are available on the website at http://www.divvyforlife.com/. The suggested retail price is $25 for the entire boxed kit, plus shipping. For ordering information, call 828.768.3025. Ultimately, the partners plan to seek financial support from corporate sponsors to launch a nation-wide program that will deliver this important message to youngsters, their parents, schools, websites, organizations, and financial institutions throughout the country. 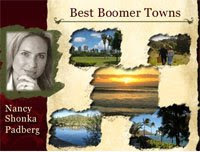 The internet radio show Best Boomer Towns hosted by Nancy Shonka recently featured Asheville, NC as one of the best towns for the boomer generation to retire to. The Chamber's own Jane Anderson, VP of Member Services, was a guest on the show. They covered all things Asheville: climate, arts, food, and retirement. This sounds like a fun event that raises funds for The United Way of Asheville & Buncombe County. It is at the new Grand Bohemian Hotel in Biltmore Village on August 27. The evening includes a seated dinner and an interactive show for only $60 per person, pretty reasonable considering the entertainment and quality of food you will receive. Every customer is now a critic, that is the new reality of business. With blogs, twitter, and websites that allow customers to review your business each and every customer has the power to broadcast their experiences both good and bad. So how do you keep control of the situation, how do you even know what is being said. There isn't one single answer to that question but the NY Times just released a great article that every small business owner should read entitled, Managing an Online Reputation. Set up automatic alerts to notify you when your business is mentioned in a review or blog. Local search sites are the new Yellow Pages -- make sure your business is listed. The more complete your listing, the more likely you are to get good search results. Respond to reviews to show readers that you are listening and that you care about customer service. Online reviews are a gold mine of business intelligence. Analyze metrics to get a better sense of your customer demographics. Don’t write false reviews to puff your business or trash a competitor. You can severely damage your reputation...and look really silly. One of our new Chamber members is Jobbitz.com and they are making a big impression on our community. I have seen social media mention her new site and even some press in the Citizen-Times. The premise of Jobbitz is simple, you have things that need to be done, Asheville has people who can do them. Take a few moments and check out the site today. Jobbitz.com is Asheville’s new locally created website, designed to connect people who have immediate “help-wanted” needs with people who need or want to earn extra cash. It is a community-based website that hosts free postings of neighborhood jobs available immediately. Examples of job categories include general house/yard work, skilled, professional, childcare, volunteering, bartering, etc. Samples of job postings so far have included re-setting a mailbox in exchange for Italian porcelain (barter section), weeding, home remodeling, junk-hauling, wood-chopping, yellow-jacket nest removing, electrical outlets updating, painting – the list goes on and on! Jobbitz.com's goal right now is to get more jobs posted! Our plea is to think about any odd jobs or “honey-do's” and post it on Jobbitz.com. Give your neighbors a chance to earn money while helping you out at the same time. Visit jobbitz.com/testimonials.htm to read testimonials from your Asheville neighbors who have already used the Jobbitz.com website. You can also visit jobbitz.com/media.htm to see video reviews on YouTube. Following the 2009 Economic Outlook presentation the Asheville Citizen-Times sat down with both presenters and asked a few questions that were submitted by viewers watching the presentation online. If you missed the Economic Outlook presentation check out citizen-times.com/section/econoutlook to watch it in its entirety. The Erin and Greg Mosher of Closet Tailors have purchased Office Environments. Both Office Environments and Closet Tailors are very active Chamber members, together this will make one powerful combination in the Asheville community. Office Environments of Asheville will transition ownership from Nina and Chris Young to Erin and Greg Mosher effective August 1st. The Moshers are current owners of Closet Tailors of Asheville. “As important to us as the business background of the Moshers, is the fact that they share our philosophies regarding customers, employees, and community involvement,” said Chris Young. In its 25th year of operation in Western North Carolina, Office Environments provides performance-based solutions for the commercial office furniture and flooring markets. Chris and Nina Young will join their son, Brian, and his team in their newly named business, Clean Environments. Clean Environments will provide commercial carpet and upholstery maintenance utilizing the MilliCare dry cleaning method, will offer SaniGlaze ceramic tile and grout restoration, as well as janitorial services. Office Environments has earned a reputation for giving back to the community through its owner and employee involvement in community related organizations and projects. Office Environments has been creating innovative workspaces since 1984 and has remained a market leader in every area they service. 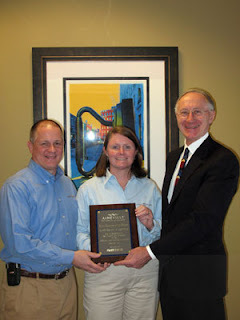 With a rich history of growth and customer satisfaction they have been recognized as a Steelcase Exemplary Performance Dealer, a Milliken Vision Award Winner, The Asheville Chamber of Commerce Small Business Leader of the Year and The Outstanding Business in Philanthropy in the Asheville area. Office Environments is a woman-owned business, and a HUB (Historically Underutilized Business) designated organization. They currently employ 45 people and operate out of a 36,000 square foot facility in East Asheville, NC, located at 1070 Tunnel Road, Asheville, NC, 28805. The company represents Steelcase, Turnstone, National, HON, and others in the commercial office furniture market. In the commercial flooring market they represent Milliken, Shaw, Lees, Mohawk, Mannington, Armstrong, and others. All product and service portfolios focus on helping the customer make best use of their existing assets with complementary services offered to help extend the life of those assets. More information is available on the company website at oeasheville.com, or by contacting Greg Mosher at 828-299-3300, greg@oeasheville.com.